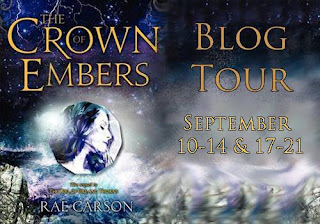 Today is the sixth day of the blog tour for Rae Carson's second book in the Fire and Thorns series. I absolutely adored the first book and was beyond thrilled when I was asked to partake in this one. Like most of you, I was holding my breath for this book. Elisa was an extremely strong character that is easily identifiable with. Although in the first book she lived through more heartache that any one person should have to. I'm extremely curious to see if she finally gets her happy in this book (which I still have to read!). Rae Carson was kind enough to answer a couple of questions for me. Lately I've been very excited about the process it takes to write a sequel. I can't imagine it's as easy as people may think it is. So without further ado, here is Rae Carson! THE CROWN OF EMBERS, Rae Carson will be released tomorrow 9/18. Laura Benson (LB): How difficult was it to write a sequel? Rae Carson (RC): You know I have to say, thank you for asking that. I think many people who are not writers or bloggers or otherwise involved in the publishing industry assume that writing a book is as easy and smooth as reading it, that we authors are sitting on a treasure trove of shiny ideas and sparkling prose gems, that we dash off stories while dancing musical numbers and farting rainbows. But it's hard. Sometimes, it's really hard. And yes, for me, the second book was harder. LB: Were expectations higher, harder? RC: Definitely. The first book was successful beyond my wildest dreams, and I kept thinking: Can I do it again? Did I just get lucky that first time? What if the second book is awful and people recognize me for the horrible fraud I am?! Which, frankly, is a ridiculous and damaging mindset. Learning to get over myself and knuckle down in the face of insecurity was probably my most valuable lesson learned last year. LB: Did you Panic, Hem and Haw, pull the hair out of your head? Yes, to all of that. But then I got in touch with some other authors—names I will not divulge but who you would definitely recognize!—and I learned something marvelous: I was not alone! Almost every author in the history of ever has had second book struggles. Just knowing that so many other authors made it through and survived helped me a lot. LB: Or was it the easiest process ever? RC: Writing THE CROWN OF EMBERS was one of the hardest things I've ever done. But I'm happy to say that it was also an amazing experience and one I wouldn't trade for anything. I ended up feeling incredibly proud of that book, and I can't wait to share it with everyone.